Without access to the real-time, birds-eye status of everything going on in your coaching programs, you are lost. Coaching Director allows you to instantly see the most important information in one place, aggregate information about coaching programs, and drill down to any level of detail. 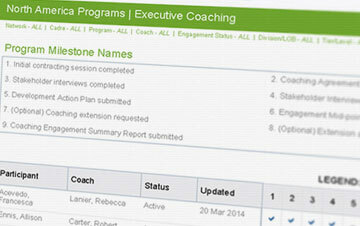 Coaching Director includes easy to use reports. With a click you have answers to all your questions such as: How many engagements are active? What trends are being observed? What are the demographics of coaching programs? and more. You need quick answers to your questions about the coaching activity in your organization. Interactive dashboards and reports allow you to move quickly from 10,000 feet to ground-level to obtain detailed information on specific engagements, coaches, and participants. If the built-in reports aren't just what you need, you can quickly create your own reports with our ad-hoc reporting tool that gives you access to all your coaching data. Create tables, summaries and graphs, and add them to your own custom dashboards. Reports can be exported in PDF, Excel or Word format. Data entered and updated in the system, along with status changes and other events are logged into a global updates history. Latest updates are displayed throughout the system, and the full history can be viewed to get a picture of all activity going on in the system.